Catherine and I recently made our first visit to the Balkans, spending just over a week in Montenegro and two days in Dubrovnik’s beautiful old town. It’s a small country and though the windy roads make it slow going at times, we were able to explore heaps as we had our own car. While I’ve read buses are good, if you’re a confident driver it’s a pretty spectacular place to rent a car and having your own transport gives you more flexibility in your plans. We were also excited to be using our new tent! 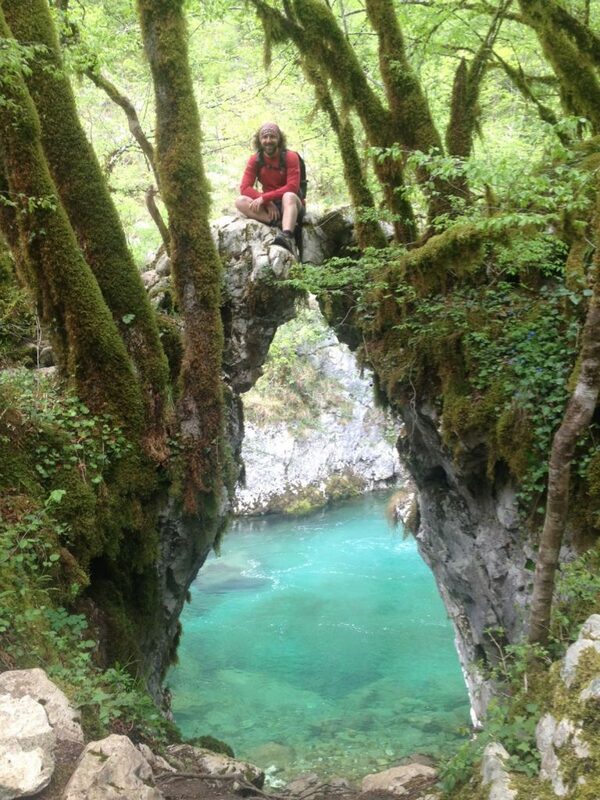 Who knew Montenegro plays home to the world’s 2nd deepest canyon, the Tara River Canyon? Stretching for over 50 miles, with just over 20 miles of that being the border between Montenegro and Bosnia-Herzegovina, it’s a staggering 1.3km deep in parts, only 200m less than the Grand Canyon in the US. 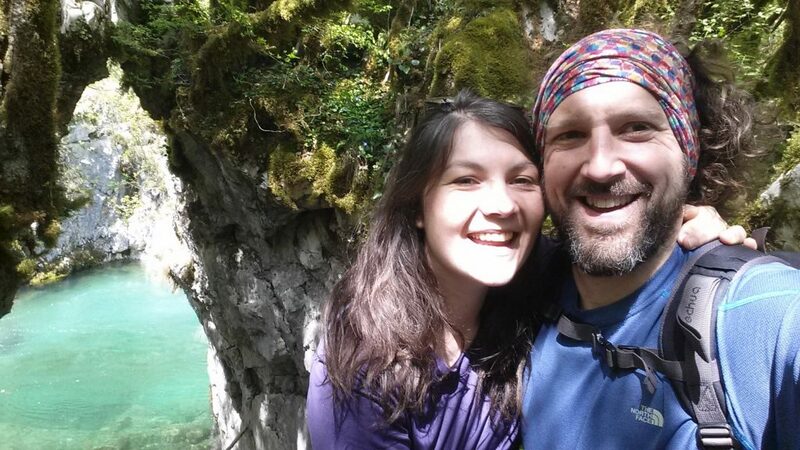 River-rafting through its walls is one of the top things to do in Montenegro and we were chuffed we were able to do it, initially reading that the season only starts on May 1st. We headed to Scepan Polje in the very north-west of the country on the Bosnian border and the €40 tour included two awesome meals, all our gear (wetsuit, boots, and helmet) and probably 3 hours on the water. (Aside from the rafting, the driving from Pluzine is absolutely spectacular as you make your way through 56 tunnels, many of which appear to have been carved from hand. 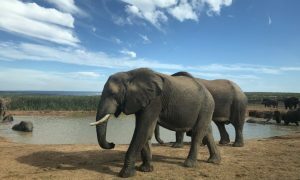 It’s only around 25kms but it’s slow going so be sure to leave plenty of time to really enjoy this spectacular stretch of the country). Views from Pluzine – you cross the white bridge to the right of this picture and essentially head through the mountain! The water was rather chilly but beautifully clear and there were a number of really fun rapids as we made our way down the canyon. It’s a real adrenaline rush as you head into them, perhaps more so sitting at the front, and I came very close to ending up in the water on more than one occasion. We also stepped into Bosnia, swimming in a tiny waterfall as we made our way down! We finished up at the point where the Tara and Piva rivers meet, enjoyed a freezing swim in the turquoise water and headed back up the hill for a warm shower, cold beer and delicious lunch. Cheers to Tara Tour for a wonderful day! You can also zip-line across the canyon alongside the impressive Tara River Bridge! 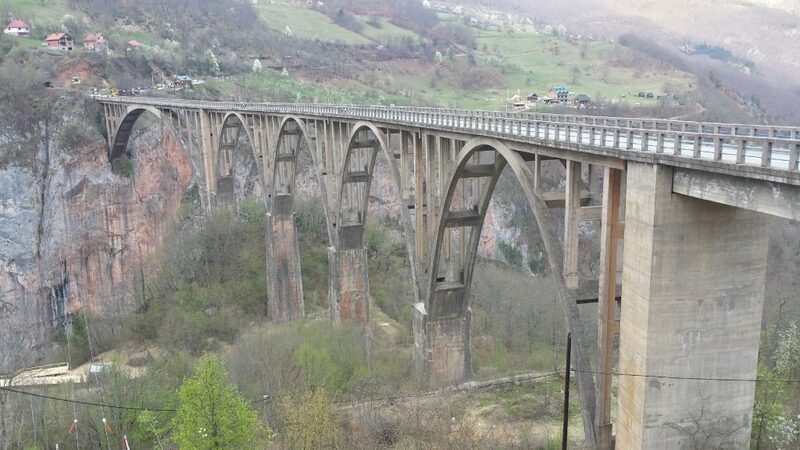 Once the largest concrete arch bridge in Europe for motorized traffic, it’s a sight in itself and for €10m you can’t pass up the opportunity to zoom alongside it through the canyon. You can just see the zip-line to the bottom left of this picture! Montenegro offers some fantastic hiking in its five national parks but if I had to pick our favourite hike, I’d say it was walking in the Mrtvica Canyon. It’s a spectacular hike with wonderfully diverse scenery – steep canyon walls, crystal-clear turquoise water that flows gently in places and forms deafening waterfalls in others, quaint bridges, and thick forest. 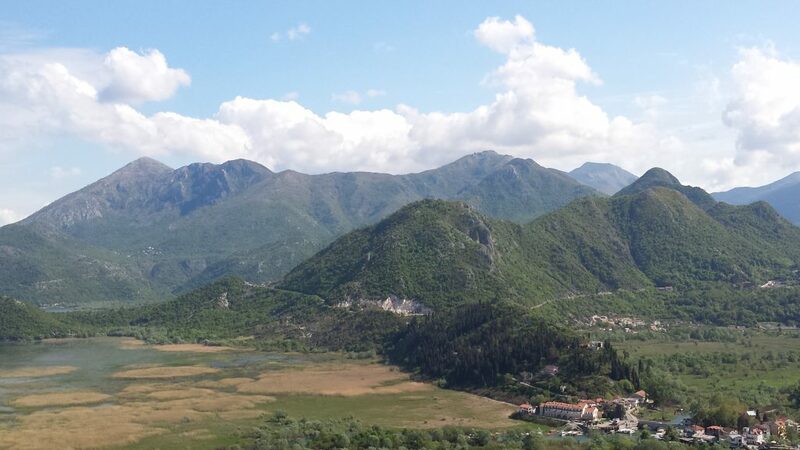 Situated around 40 kms north of the capital Podgorica, it’s tricky to find – a little way past the Moraca Monastery is the tiny village of Medjureceje and just past that you’ll see a tiny arrow pointing to the start. You’ll continue down this road until you come to an open field where you can park. We had read about the owner magically appearing to claim his €3 parking and though he was nowhere to be seen, we left some coins on the windscreen. Finding the trail was even more difficult because the owner has painted markings that take you over a bridge and past his house! When you walk out of the parking, turn left and almost immediately left again up and into the forest. From here you follow the red and white circle markings and it’s generally well-marked. You’ll walk along a road for a while and past a few houses before coming to a stone bridge – do not cross this and continue straight on into the canyon. Keep following the trail markings trail until you see another small wooden bridge in the canyon, which you’ll cross on your return. Continuing straight for maybe 15 minutes, you’ll see a little offshoot to your left – this is the Gates of Wishes, perhaps the most beautiful part of the hike and the perfect spot for a (freezing) and very quick) swim. We continued for probably a further 45 minutes as we wanted to see the ‘tunnel’ – a section of rock that’s been blasted away to create a trail. I’m not sure if impressive is the right word but it’s cool to see. We had read you could continue even further to a beach but we decided to head back, stopping for lunch at the Gate of Wishes and then crossing over the rickety wooden bridge. A short steep climb brought us out of the canyon and we made our way back to the car, accompanied by the car-park owner who had tracked us down with his binoculars! 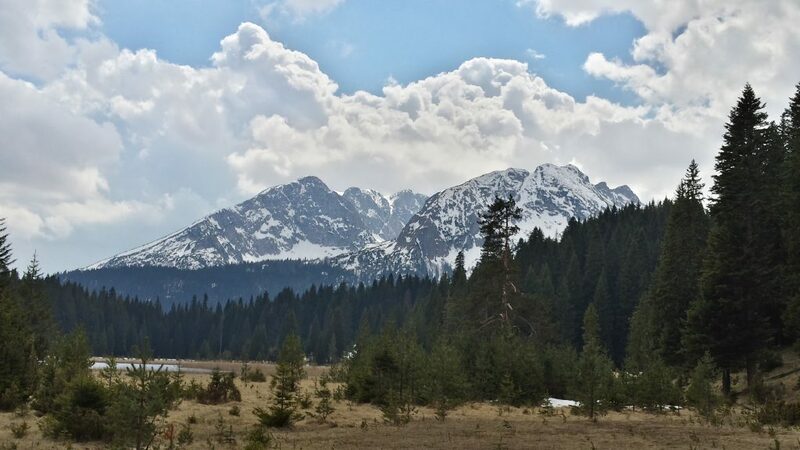 Situated in the north of the country on Zabjlak’s doorstep, Durmitor plays home to over 40 mountains above 2,000m and over 15 glacial lakes, beautifully known as the ‘eyes of the mountains’. It’s accessible year-round with skiing over the winter and hiking in the summer. There are heaps of trails to explore and these were extremely well-marked with easy-to-spot markings on trees and and regular bright-yellow trail signs. Unfortunately snow curtailed our plans to do a multi-day hike and summit a peak but we enjoyed a phenomenal day’s hiking at a lower elevation and took in three beautiful lakes, the most famous of which is the Black Lake (Crno Jezero). Accommodation – in summer, you could easily hike for days and camp inside the park. There are also two camp-sites just outside the park, though both of these were still shut. 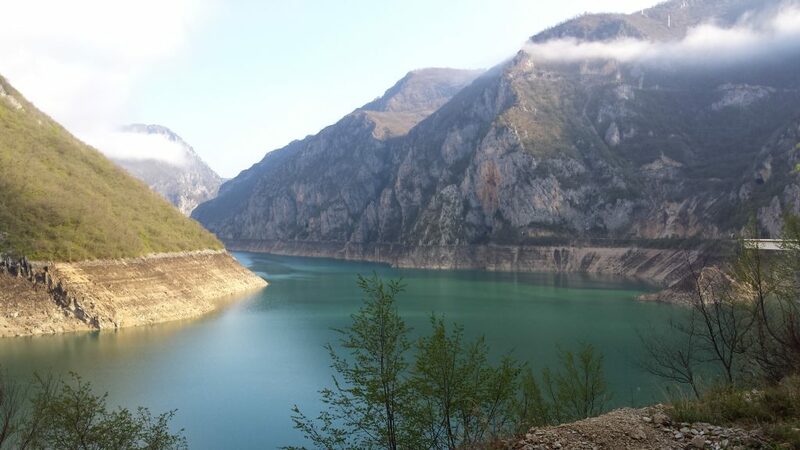 There is, however, a third campsite just outside Zabjlak – Autokamp kod Boce (€3/person). With a sign off the main road, it was easy to find and had good facilities. It’s also owned by the lovely Drasika, who invited in for coffee as were starting to pack up just after 6am. The hot, strong coffee was very welcome after a cold night in the tent and seeing our charade gestures showing how cold we had been, she promptly poured 3 shots of the local shovloviza and smiled – this was clearly better than coffee to warm us up! The smallest of Montenegro’s 5 national parks, Biogradska plays home to hundreds of acres of dense forest and the centrepiece is the beautiful Lake Biograd. Unlike Durmitor, there’s not heaps of trails here and a day would suffice – it’s a lovely walk around the lake and you can climb up two mountains from the lake car park (snow prevented us reaching the top unfortunately but the ranger said it would be a 5-6 hour hike). Accommodation – there’s both camping (albeit without heaps of grass) and cabins in the park next to the lake (€5.5/person to camp and €11 for the cabin). Unfortunately it started pouring just as were finding a spot to pitch our tent so after waiting it out in the car for a while, hoping unsuccessfully that it would stop, we decided to look up the mushroom accommodation we had seen on Air BnB (search ‘Art Apartments – Minic). 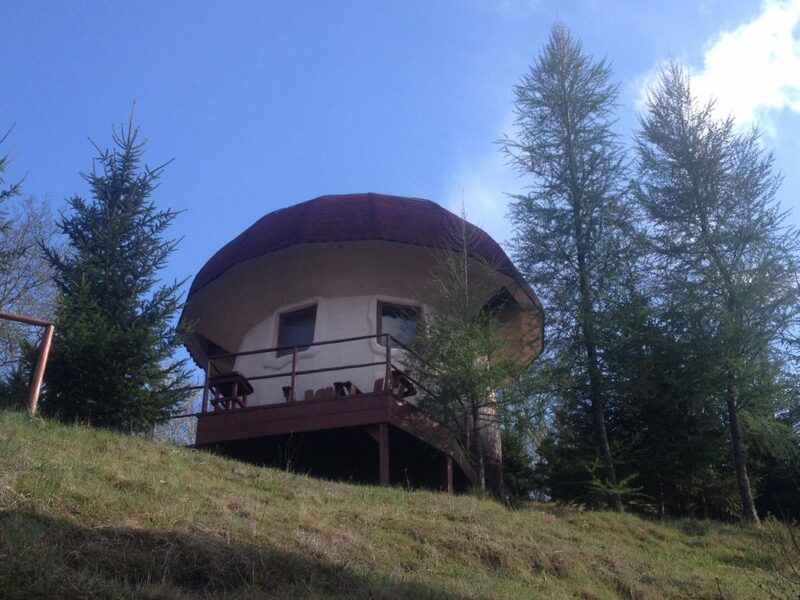 We discovered that these were just outside of Kolasin, no more than 15 minutes away, and it was a really fun place to spend the night (the bathroom and lounge/kitchen are in the stalk with a bedroom up a small flight of stairs in the cap). The biggest lake in the Balkans, Lake Skadaar straddles the borders of both Montenegro and Albania and is surrounded by Karst Mountains. 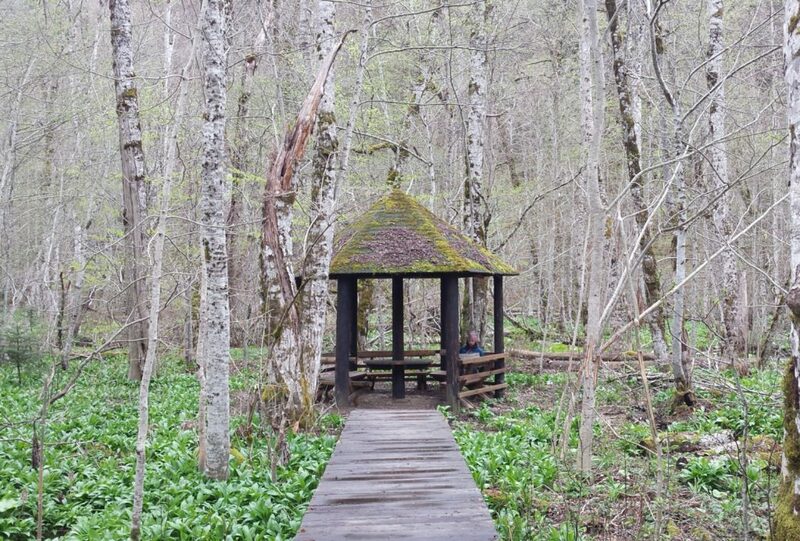 Around one hour from the shore town of Virparzar, along a single track windy road, is the village of Rijeka Crnojevica and just outside town is a stunning viewpoint of the water-lily-lined Crnojevic River that flows into the lake. The village is also home to the huge Obod Caves, an easy 90 minute return walk. The water-lily-lined Crnojevic River that flows into Lake Skadaar. To the left, you can just see the domed hills affectionately known by the locals as Sofia Loren! Accommodation – we found 2 campsites, both of which were just outside Virparzar. The 1st was a beautiful farm called ‘OK’ and the second a patch of ground just past the Vinarija (wine farm) Durisic. It’s possible to do wine tasting here too – just knock on the front door to be shown into the cellar by the owner in her slippers! We also experienced the biggest storm on our 2nd night – torrential rain, winds of up to 40 miles/hr and thunder and lighting that was quite something to see wrapped up inside our sleeping bags. This was the first trip using our new tent and we were so incredibly chuffed to wake up dry in the morning – nothing will worry us now! How on earth did they build the Ostrog Monastery?! 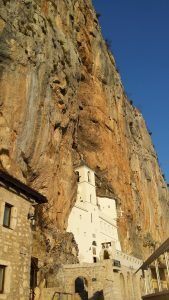 Montenegro is also home to what seems like hundreds of churches and monasteries, with the most impressive being the Serbian Orthodox Ostrog Monastery that leaves you wondering how on earth it was built into a cliff face. Built over 350 years, it’s both the largest and most popular pilgrimage site in the country and it’s free to visit. Just outside Pluzine, we were lucky to find the Piva Monastery. It’s not much to look at from outside but stunning inside with floor-to-ceiling murals and the most beautiful patterned doors. We also really enjoyed the serenity of the Moraca Monastery grounds and the beauty of it’s interior and doors, which is similar in style to the Piva Monastery. 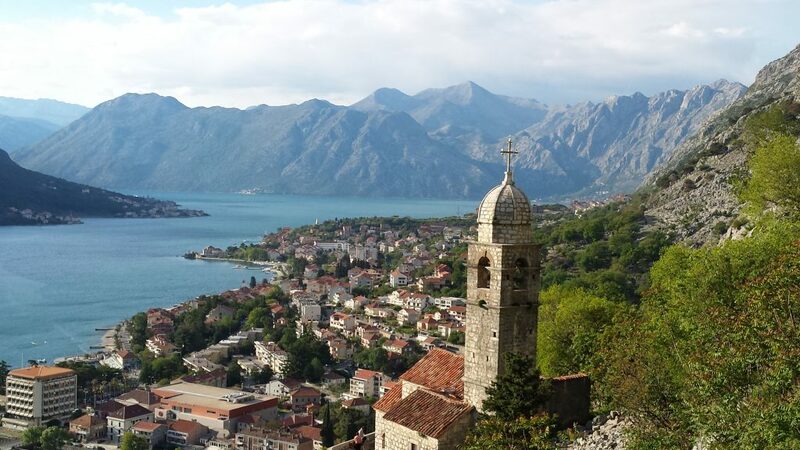 Montenegro’s mountainous scenery creates some epic driving – windy roads that host both hair-pin and sweeping bends, dramatic natural beauty that attempts to take your eyes away from the road and a never-ending number of tunnels it seems. There are no shortage of spectacular routes; in fact most stretches are great fun so don’t be too worried about driving the ‘famous’ drives noted in the guide books. 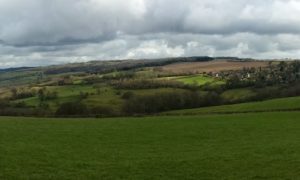 Leave plenty of time as the windy roads can make for slow going – and you’ll want to stop often to take in the wonderful views. Head up the slopes of Mt Lovcen on the back ‘mountain’ road from the Bay of Kotor to the Lovcen National Park. The road starts off gently enough before 25 hair-pin bends await and while it’s a good road, it’s extremely narrow in places with just about 2 cars squeezing by. 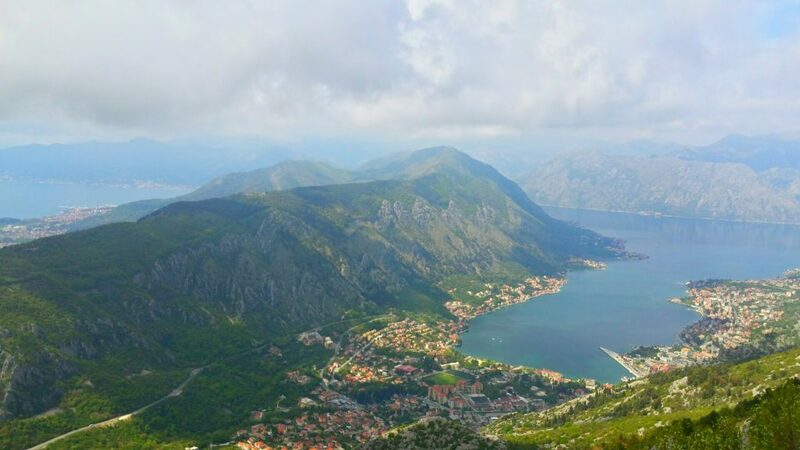 The views of the Bay of Kotor as you head up are simply stunning. The drive from Pluzine to Scepan Polje through 56 tunnels, many of which appear to have been carved by hand, is unreal. 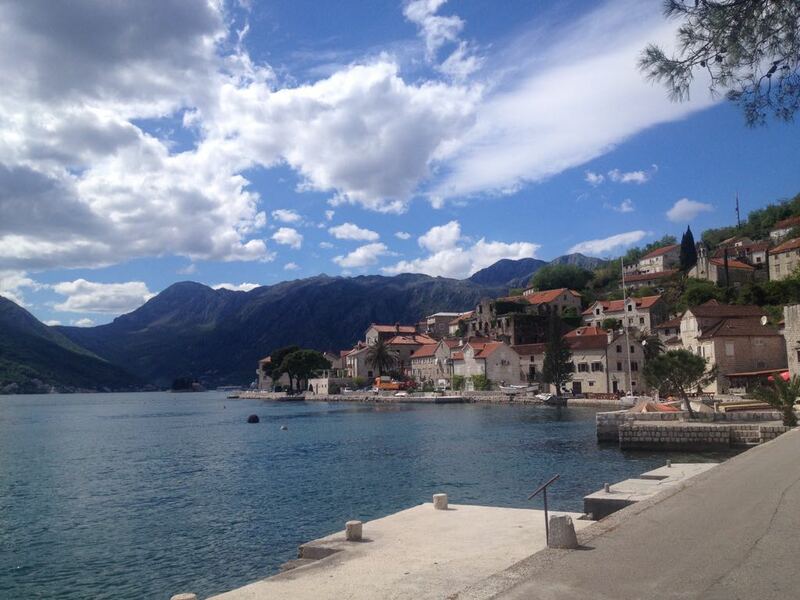 The Bay of Kotor is simply stunning and Kotor’s old town is very enchanting. It’s far cheaper walking on the ancient walls here than in Dubrovnik (€3/person vs. €20!) and the views of the bay up 1,300 steps atop the St John’s fortress are gorgeous. We also enjoyed a delicious lunch in the quaint former fishing village of Perast, a short drive along the bay from Kotor. The ruins of the old town Stari Bar make for an interesting afternoon and there are a number of lovely restaurants to admire them from. We’d been eating pasta most evenings so the meal we had was a real treat. We also camped in the beautiful Bartula olive garden just outside town and I can’t recommend it enough. Flights – we flew into Tivat and out of Dubrovnik as there are more flights out of Dubrovnik than Montenegro, and they’re cheaper. It’s a 2 hour bus ride from Tivat to Dubrovnik. Car rental – we organised this in advance and there’s no shortage of companies online. 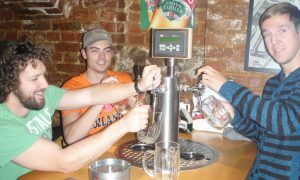 Visa – SA passport holders can enter on a Schengen visa. Accommodation – as described above, we camped most evenings. 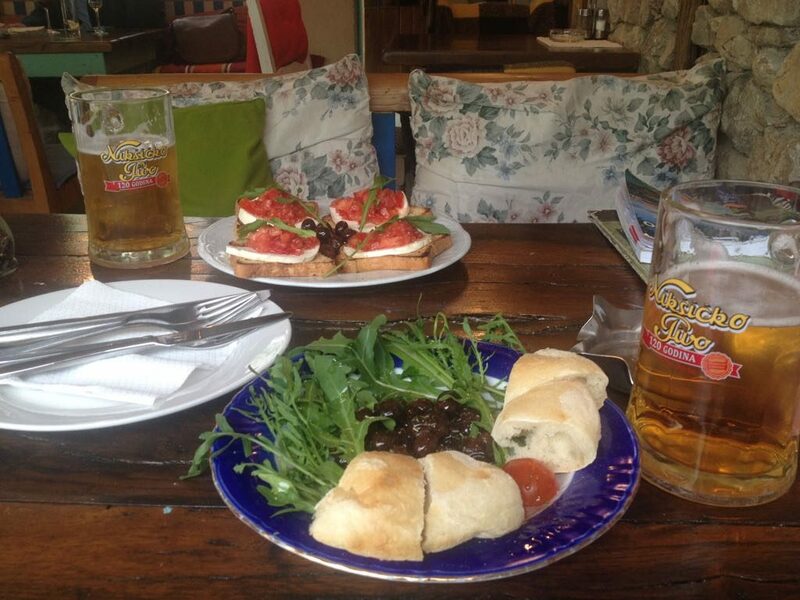 We found the mushroom accommodation online (search ‘Art Apartments Minic’) and stayed at the Old Town hostel in Kotor.